by Mishelle | Jun 9, 2018 | Jazz Harp Duet Concert starring 2 Gals & 2 Harps! 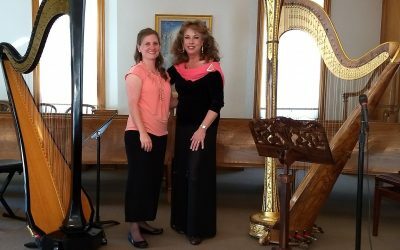 SO, It was pure Heaven getting to pull my strings with my Harp Colleague, Becca Bryce, to play jazz standards, with a little Classical thrown, at the Historic Pine Valley Chapel, in Pine Valley, Utah. And Yes, it did take two guys to haul our Harps up all those stairs, for an evening of pure joy, and fun. It doesn’t get any better than to have the opportunity to play such great songs as, “Tea for Two”, “Summertime”, and “Take Five”, just to name a few for the nice people here in Utah.